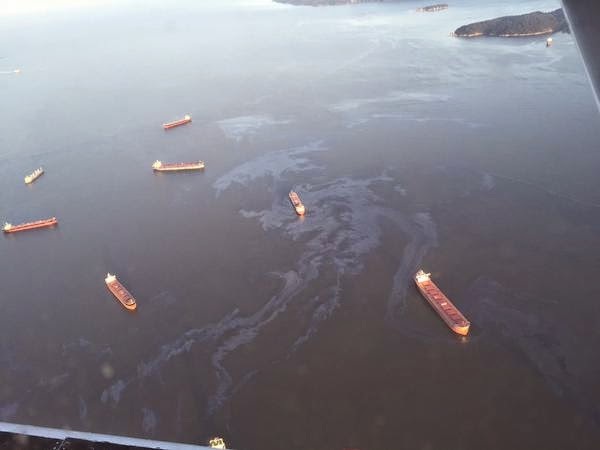 The 'relatively small' 3,000 litre spill by a freighter in Burrard Inlet has certainly put a sharp point on how much damage can be done before emergency measures kick-in. Of course there is the usual finger pointing, the Mayor blaming the Province and Feds, the Province blaming the Coast Guard and on it goes. In the meantime it also raises the question of how would a similar incident be handled in Nanaimo harbour should one of the many freighters sitting at anchor encounter a similar problem. I have asked the Nanaimo Port Authority for information as to what our plan is to deal with a similar spill should it happen here.